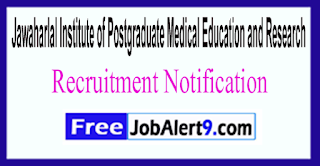 JIPMER (Jawaharlal Institute of Postgraduate Medical Education and Research) Has Released ipRecruitment Notification For 39 Professor, Associate Professor Posts. 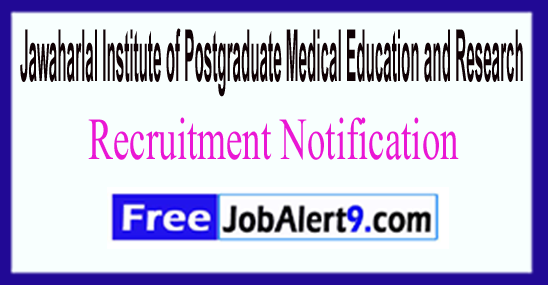 All Eligible & Interested Candidates Can Apply Offline.xam Pattern, Syllabus for JIPMER (Jawaharlal Institute of Postgraduate Medical Education and Research) Recruitment 2017 - 39 Professor, Associate Professor Post is mentioned below. Age Limit - Candidates upper age limit should not Exceed 70 -Years (Post 1), 50 -Years (Post 2,3), 35 -Years (Post 4) As on (05-06-2017). Pay Scale - Rs. 1,60,000/- (Post 1), Rs. 1,30,000/- (Post 2), Rs. 1,20,000/- (Post 3), Rs. 60,000/- (Post 4) . How To Apply - All Eligible & Interested candidates Can Download application Form through official web-site (http://www.jipmer.edu.in). After Filling The application form, candidate must send by hard copies of application a long with relevant testimonials (Mentioned In Detailed Advertisement) to the following Address before / (5th June 2017). Address -Dr. D.K.Patro, Deputy Director (Admn.) Office of the Deputy Director (Admn. ), JIPMER, Dhanvantari Nagar Post, Puducherry – 605 006 . Last Date for Receiving Hard Copy of Application Form Is - 05-06-2017.